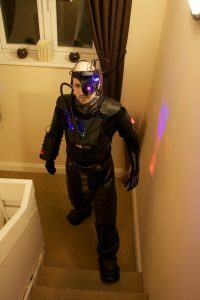 In 2010, I created this Borg (Star Trek). This was the second I have put together. I love the Borg and how you can freestyle as mush as you like. I used DVD boxes, BMX armor loads of small LED’s and a moving mechanical eye. This costume went out for Halloween and due to our camera having a fault, this photo below is the only good picture I own. If you saw me out and have any photographs of this Borg, Please message me as I would love to see some other pictures of it.